Garnets come in several different shades, but the most common garnet for January's traditional birthstone is a deep red color. It is acceptable to replace a true garnet with a synthetic garnet for less expensive January jewellery, but the use of the real stone is considered more appropriate when giving someone a birthday gift. Compared to other precious gems, garnets are relatively affordable as settings in all kinds of jewelry. The most common settings tend to use dark red garnets in solid silver so that the glow of the garnet can reflect on the polish of the silver. Garnets are gems that have been used since ancient times as talismans of strength or protection. There is evidence that the garnet was worn by soldiers to protect them from injury or death on the battlefield. Garnets have held several different meanings for different cultures over the centuries. In most cultures the glowing gem was thought to contain healing properties, especially in matters that involved the cardiovascular system. In Asia, soldiers believed that the garnet had more devastating properties than normal bullets when fired from a gun. In the modern world, garnets are thought to represent faith, truth, and loyalty. Garnets form inside rocks that are called metamorphic rocks. Metamorphic rocks include igneous or sedimentary rocks that have been transformed through exposure to severe heat or compression. Some garnets can be found in stream beds or river beds as pebbles. Garnets can also form deep inside the earth when metamorphic rocks rub against one another as the earth shifts. This type of mineral formation is called grinding. Grinding creates the most abundant layers of garnets that can be mined in a traditional manner. Many garnets that are formed through grinding have small fragments of metamorphic rock within the gem stone, which makes it easier to tell how the garnet was made. 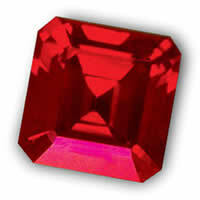 A garnet is a form of nesosilicate. There are several different types of garnets that range from red to yellow to very rare blue garnets. The color of each garnet is based upon its chemical composition. 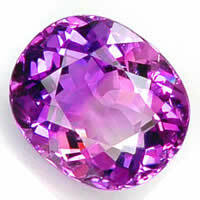 If a garnet contains extra amounts of vanadium it will look more purple or blue. The most common garnets that are red in appearance are made primarily of iron and aluminum that has been compressed within a metamorphic rock. Magnesium, calcium, and chromium are also commonly present in garnets. 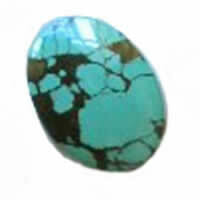 The different levels of each chemical has a direct impact on the overall color of the stone. Garnets have been found in almost every country of the world. Archeological evidence places garnets in ancient Egypt as well as parts of Czechoslovakia, Sumeria, and Sweden. The largest garnet reservoirs in the world today can be found in parts of Eastern Africa. Europe and South America are also large producers of high quality garnets. What is possibly the largest intact garnet in the world was discovered in central Australia. India, Brazil, Russia, and the United States have sizable quantities of garnets as well. In the United States there are garnet deposits in nearly every state. Though garnets are not as precious as other gem stones, they are very popular stones that have a steady market all over the world.